It is OK to try something you don't know. It is OK to find your own pace. It is OK to do it your way. It is OK to bungle -- so next time, you are free of the fear of failure enough to succeed. It is OK to risk looking foolish. It is OK to be original and different. It is OK to wait until you feel ready. It is OK to experiment -- safely! It is OK to question the "shoulds." It is special to be you! It is necessary to make a "mess," which you should be willing to clean up. The act of creation is often messy. #10 To help your community and to wear fancy duds. #9 To witness stupid comic skits for free. #7 To conduct a one-hour meeting that took three anguish-filled hours to prepare for Cub Scouts who only want to know, "What's the snack?" #6 To sew hundreds of little patches on a uniform only to have your son outgrow it. #5 To go out and enjoy nature with a bunch of nine-year-olds instead of watching the University of (Your home State) play football. #4 To provide the perfect excuse to your friends so you don �et have to golf, go to dinner, or play tennis with them. #3 To get rid of ail those worthless pieces of string, yam, fabric, wire, and plastic milk bottles. #2 To collect and store forever priceless crafts made from useless pieces of string, yam, wire, and plastic milk bottles. 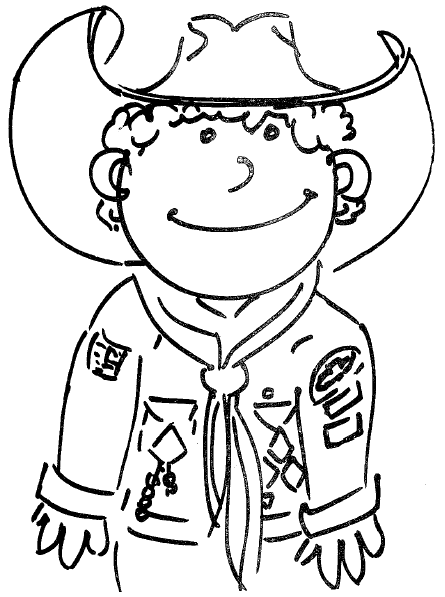 would be an adult Scout volunteer. . . .
#1 To clear your wallet or purse of those filthy, germ-laden $10 or $20 bills!